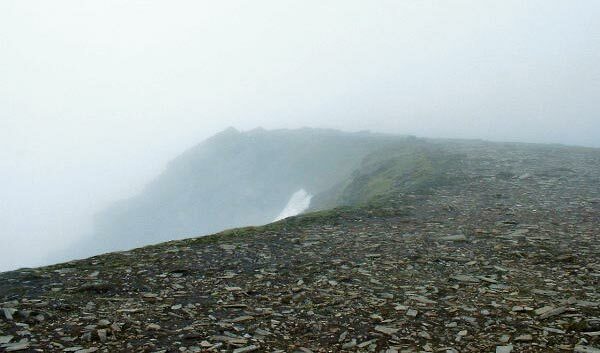 The stoney summit of Aonach Beag leading round the edge of the north face and up to the cairn in the distance. 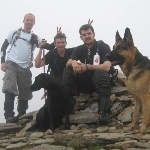 The summary information of one or more ascent routes that include Aonach Beag [Nevis region]. 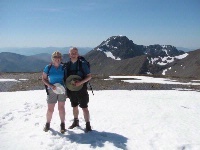 Joyce and Ian enjoying typical Scottish mountain heatwave(!) 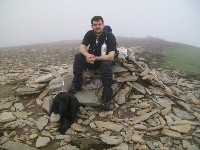 on the summit of Aonach Beag, with the Ben behind. 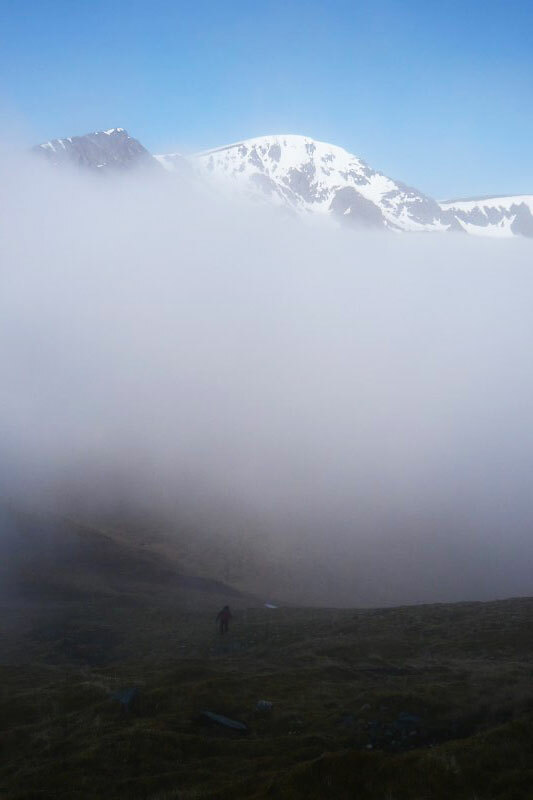 Post a few words about Aonach Beag [Nevis region] or read what others have had to say. Take care to locate the correct point to begin the descent down from the summit plateau to the bealach between the Aonach summit plateau and Carn Mor Dearg. Do not descend from the lowest point. The top of the preferred route is marked by a small cairn, well offset from the direct path between the two summits. Best found by walking along the west edge of the plateau but take extreme care in poor visibiity. Even that route is trcky, being steep and with a lot of loose surfaces. When descending Aonach Beag to get to Sgurr Choinich Mor, first follow the ridge south west, than when you see the main path go south east go to the corner and find a very steep winding path twisting itself down the craggy slope. We descended with a heavy overnight but please realise that this descend is not for the inexperienced. Did these from the gondola station. Slight cheat but then gives access to a much less travelled route onto Carn Mor Dearg allowing all 4000ft'rs in lochaber to be reached in a day. Although you do have a tricky westward descent from the bealach between Mor & Beag .... not fun in good weather never mind bad! 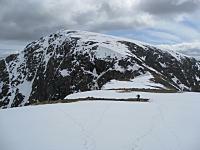 Completed both Aonach Beag/Mor from the apparent less favoured route from Coire Giubhsachan. The path up the west slopes, although steep, was fairly easy going. Once onto easier slopes, the summit of Aonach Mor is 3/4km on a 12degree bearing. The ascent from the bhealaich between these two mountains is very narrow, but once the cloud base lifted, the views all round are spectacular. 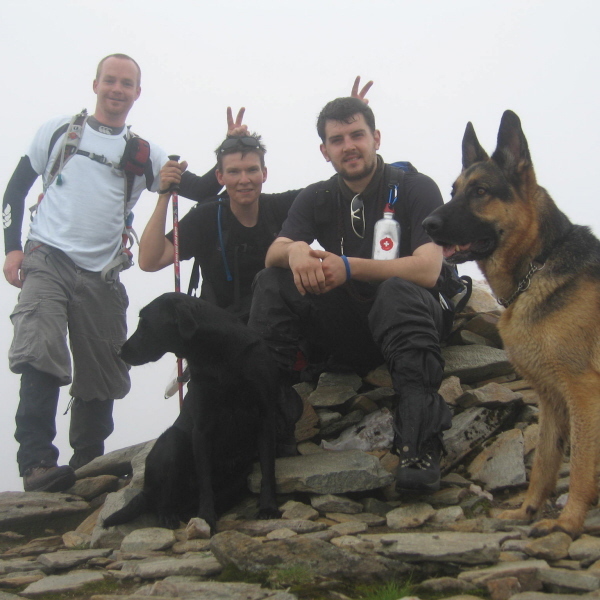 A very rewarding days hillwalking. 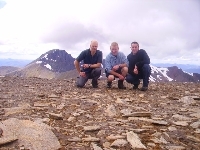 Completed on a beautiful spring day in May 2002 (with Aonach Mor). Superb 360 panorama, one of the best. Dont descend from the bealach between Beag and Mor...its very risky.